Newlyweds are kind of grossing me out right now. No offense to anyone, but geez. If I see one more "just because" bouquet pic on fb, I'm probably going to smash the computer monitor. The chairwoman of the Democratic National Committee delivered this scathing accusation against Republicans: They want to make illegal immigration....illegal. No, I'm not kidding. Just out of curiosity, does anyone have any hard statistical data on how many (if any) milspouses have been assaulted because they have deployment bumper stickers on their car or mention a deployment or FTX online? No, I'm not talking about fear-mongering speculation ala the Shana Hight tragedy. I mean actual real facts. My hunch is no, because in typical military risk-aversion-over-correction fashion, we make rules based on what-ifs rather than let individuals make their own decisions. Personally, I wouldn't put a deployment bumper sticker on my car, but that doesn't mean I think someone who does deserves to suffer misfortune, and that's how people seem to act. And again, I've never heard of anyone actually being assaulted because of a deployment bumper sticker, so I'm wary of trying to guilt people - especially moms - saying "You're putting your family in danger!" without some real data to back it up. Because, even if you think it's a stupid decision, well, this is America, and in America, people have the right to make stupid decisions. Thank goodness. 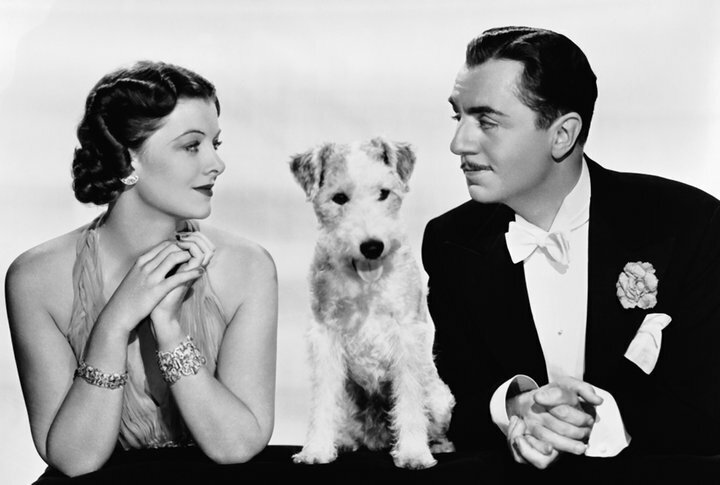 They're remaking The Thin Man, only one of my Top 5 All-Time Favorite Movies. I am dreading it. The Thin Man worked because it relied on basic deduction and the great chemistry between the leads, a super-wealthy married couple who liked to party, 1930s style. I cannot imagine that formula translating well to the 21st century. After all, today we can't watch any detective show without there being some sort of high-tech super lab where they can run DNA matches in under 10 minutes from national databases. And to top it all off, they cast Johnny Depp as Nick Charles. Johnny effing Depp. Which means we'll basically wind up with the debonair and charming Nick Charles turned into Cap'n Jack Sparrow in a tuxedo, since that's Depp's schtick now. Blech. As yet they still haven't cast Nora, but they aren't going to improve on Myrna Loy. They just can't. Anyway, like I said, you just have to watch it to understand where I'm coming from. The link up there is to the Netflix listing. Add it to your queue pronto. The blog purge has been completed (for now). I cut a lot - almost half of my list. I also plan on giving myself a break on the commenting thing, and rather than feeling pressure to sit down and spend an hour or so coming up with comments, I'll just comment when inspiration strikes. That probably sounds like a "duh" thing, but it was really getting out of hand over here. The best part? It only cost the taxpayers $2 million to come up with this. I'm still looking in the Constitution for the enumerated power of the federal government to spend our money on pie charts regarding individual diet choices (as well as the enumerated power to control children's education, but that's another topic). Last night El Paso had its first legitimate rain in over 6 months - which also meant it was the first rain the dogs had ever experienced. Let me back up - Wednesday night, it drizzled for 5 minutes. But for those 5 minutes, Achilles HAD to be outside. He could smell the rain and needed to investigate. Every time he felt a rain drop, he would jump and spin around try to find the source of it. He could not figure out where this water was coming from and why he was damp. It was hilarious. So last night, when it was really honest-to-goodness raining, the boys just had to be outside. So we left them out there for almost an hour while they ran and jumped and wrestled in the rain. (Upside to living in the desert: even though our back"yard" has no grass, it's all sand, so it doesn't turn to mud when it gets wet. It just brushes off. Score.) When we brought them inside after brushing them clean, they both had looks on their faces like, "OH EM GEE, THAT WAS THE COOLEST THING EVER!" :) They were grinning for 10 minutes. And they both slept until 9:00 this morning. Double-win. So on the last run, I was really struggling. And so I started praying. I've tried using the running time as a sort of "get alone with God" time, since there's no computer or puppies to distract me...and I need to distract my mind from my burning ankles to keep going. So I started praying and came to a place where I decided I can and need to start making these running sessions, and any exercise I do (because I need to get back in weight training again) as an act of worship to God. After all, He gave me my body, He gave me my holey heart and everything else that goes with that. So I used that last 60 seconds to just thank God for my heart, and my lungs, and my legs, and my feet, and my very, very sore ankles :) And on and on. And as I was thankful, I felt strength just pour through me and carry me through till the end. I don't really know how to describe it, but I really feel like I connected with the Holy Spirit in those 60 seconds. I wish I hadn't waited so long, I couldn't have spent the whole 20 minutes like that. Next time. On the first one, I couldn't agree more hahaha. I'm definitely going to check out The Thin Man. I've not heard of it, but I'm going to Netflix now. The other week wrote about the issue of publishing your deployment to others (banners/bumper stickers etc). More specifically, I talked about the blue star banner on my front door because the idea of it makes me a little nervous. Nonetheless, it's still there and will remain there! I think it's fine and I'm sure there is nothing to worry about. Heck, I don't live anywhere near a military post so most people probably don't even know what it means! Okay, the illegal immigration thing made me laugh! I'm not sure about the bumper sticker thing, but here in Hawaii I hate having the base sticker on my car (I don't know if I'm going to put my yellow ribbon magnet on my car yet) just because a lot of the traditional Hawaiians still don't like the military being on "their" island, and sometimes our cars get targeted for break-ins. The story about your dogs is hilarious, my parents dogs do the same thing in AZ. Good luck with running- I despise it, but I understand it, haha. The bumper sticker thing...I haven't heard of anyone being hurt but I wouldn't put one on my car just because it doesn't seem wise to advertise that I'm home alone with (soon-to-be) two kids and since I do have the family stick-people stickers...it's too much info. I do, however, have an "Army Wife" sticker which I think is super cute and I'm pretty sure it's gotten me out of a speeding ticket or two BUT on the flip side of it, on Monday (yeah, Memorial Day) I was yet again speeding and got pulled over. The first thing the cop said was "So...you're an Army wife." Innocent enough but the tone he had and the way he looked at me made me want to reply with "yeah, why did you get kicked out of boot camp?" I refrained but I ended up with a ticket for 63 in 45. For the record, I was going 55. I know it for a fact because I had my cruise control on...it was a country road...I was 2nd in a line of 4 vehicles all going 55...the cop passed the two behind me but pulled me over. Obviously I have no way of proving any kind of bias but I just felt targeted. I don't have anything on my car (except post decals) that show I'm a military person, I dont really think if I did, I'd get harassed but I dont like calling attention either. You make me laugh (the first two)! For the deployment thing...I wouldn't put something on my car, not really my style, but I mention things on my blog. It has made me think I should go private, but I'm completely torn on the subject. I just can't NOT mention it, because it's a journal for our family, and to ignore something like that would feel weird. I should probably refrain from using our names as well, but again, it feels weird to do that in a journal. I would like to think I'm not purposefully putting my family in danger, but maybe I'm just naive. Here's an honest question, please don't read it wrong, but what made you decide to use an alias when you started your blog? When I started blogging I didn't even know there were unwritten rules about all these things, or that some people made aliases or had private blogs. I was just doing what lots of other people my age were doing. I'm sure you, and your more knowledgeable readers, are looking at this comment and rolling their eyes! I'll probably just go private once we hit the deployment here in a short bit. Ahhh, I don't know. I'd actually love some advice on the subject. Wow. That was long. Sorry!